Crestware BNG Rubber Industrial Gloves 18"
TigerChef > Janitorial Supplies > Cleaning Supplies > Kitchen Gloves >< Dishwashing Gloves > Crestware BNG Rubber Industrial Gloves 18"
$10.79 Winco NLGH-18 Heavy-Duty Natural Latex Gloves 10-1/2" x 18-1/2"
$4.65 Winco NLG-816 Ivory Natural Latex Gloves 8-1/2" x 16"
$4.91 Winco NLG-916 Ivory Natural Latex Gloves 9" x 16"
Perfect for keeping hands protected while cleaning, the Crestware BNG Rubber Industrial Gloves 18" are a must-have for both home and commercial use. 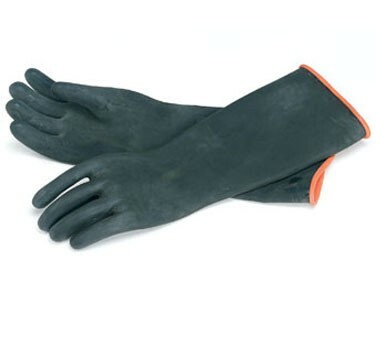 These gloves are made from neoprene rubber for superior quality and durability. Thanks to their 18" length and extra thickness, these gloves have a long arm coverage providing excellent protection against many hazards. For added convenience, these gloves are washable and safe for reuse.